AIAI is a non-profit organization formed in the District of Columbia to help shape the direction of the national Public Private Partnership marketplace. AIAI serves as a national proponent to facilitate education and legislation through targeted advocacy. AIAI’s Board is comprised of leaders of the construction and development industry. 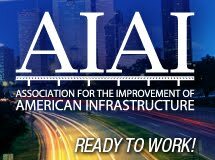 Their extensive national and international experience and industry knowledge provides AIAI with a clear direction for developing and advocating policy and legislative solutions, allowing more equitable and effective partnerships across diverse market sectors from transportation and energy to educational, health and public service institutions.